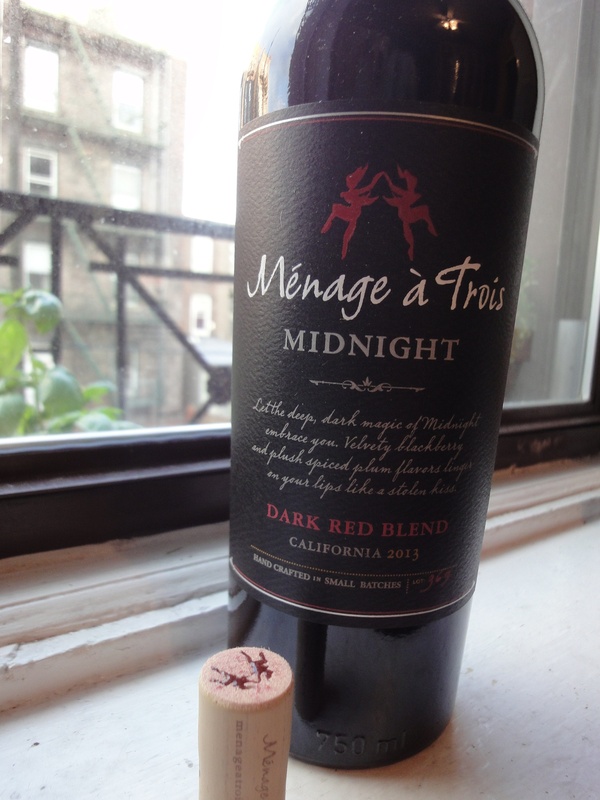 Yes, it’s round enough, and soft on the palate, the 2013 Ménage à Trois Midnight. But also lacking in subtlety, short on finish, and generally one-note syrupy. In other words, it’s hard to recommend this California label’s “high-end” red-blend selection for anything other than as an inexpensive party wine (and you can find better wines at lower prices even for that modest purpose). I paid $15 at ShopRite for my bottle but would have done better to trek to Buy-Rite, which carries it for $11. To be fair, Ménage à Trois—the brand is under the Trinchero Family Estates umbrella—meets a huge swath of market demand—for simple, goes-down-easy, not-expensive wine. And if their offerings serve as a gateway for novice oenophiles to more complex, better-made blends and varietals, hooray to Ménage à Trois. Ménage has recently expanded its line from generic red and white blends to varietal-centric blends starting with Chardonnay and now including Cabernet Sauvignon, Merlot, Malbec, Pinot Noir and Sauvignon Blanc; they even make a Prosecco. Only the Cab and Merlot are priced above their blends ($12 at Buy-Rite); some day maybe I’ll try them.